It's late and I'm about to fall asleep, but I didn't want to break my streak by not posting tonight. 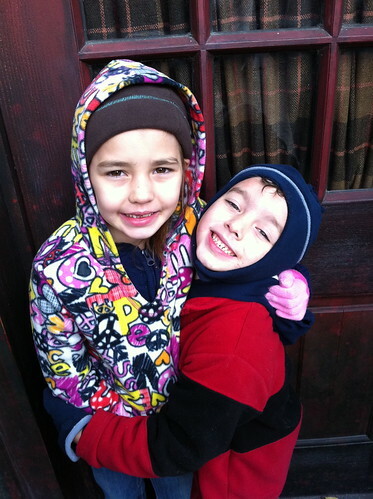 I have a houseful of sick children, and there has been way too much projectile vomit going on in this house today. The kids all got flu shots recently, so I don't know if that's what's causing this, but all four of them are sick. Whiny, achy, vomity, sickly children. Now you really want to come hang out with me, huh? 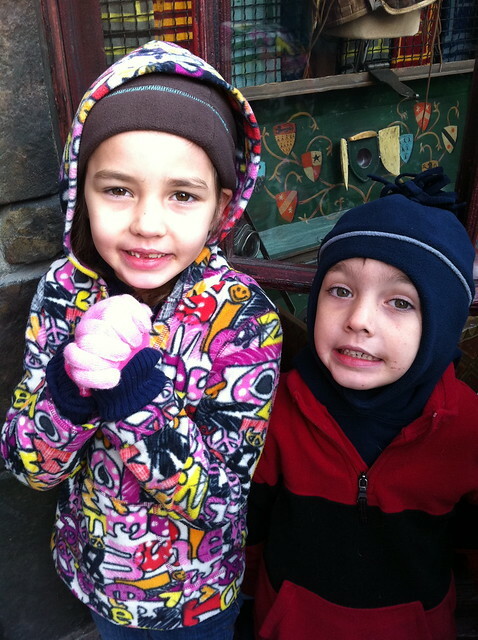 Just after Christmas Ava and Jace and I got away to Orlando to visit the Wizarding World of Harry Potter. We had read the first book together over the summer (I have ready them all about fifty times a piece and have been wanting to go for a very long time...nerd, I know), and they've seen the first movie. So we braved the week-after-Christmas crowds and headed in. It. Was. Insane. So packed, and so, so cold. We almost died. Not joking. Those aren't awkward smiled, they're chattering teeth. The early morning was brutal. Even by northern standards, according to all the tourists there. 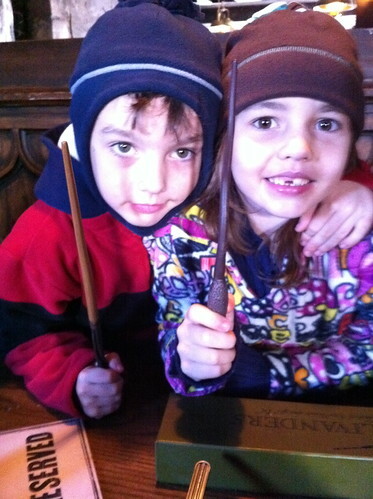 We had to wait two hours in line to go into Ollivander's wand shop just to spend a ridiculous amount of money on wands. But...and this will prove to you how nerdy all three of us are...it was worth it. 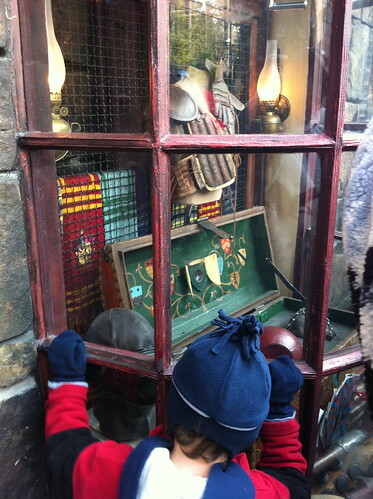 There were lots of really cool little things to look at in line, like the windows of Flourish and Blott's and a set up of Quidditch gear. The whole place is extremely immersive and realistic looking, and we had a great time wandering around with the thousands of other people in the park. In fact, it got so crowded they couldn't even let anyone else in until 8 pm that night. We ate lunch at the Three Broomsticks and I failed to sample a butterbeer. I don't know. I need someone to tell me what it tastes like before I try it. Even in the cold, we had a great time, and Ava was just thrilled with the way she could finally see everything we'd been reading about. 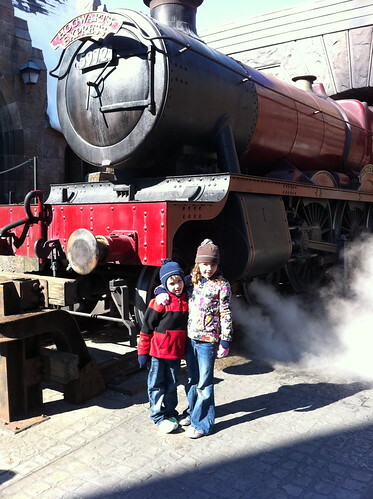 We saw the rest of Islands of Adventure as well, but the Harry Potter section of the park is definitely what the kids came home talking about. In fact, now they can't wait until they turn eleven to find out of these faulty wands will ever work, or if they'll be sentenced to being Muggles for the rest of their days. Jace, especially, thinks that there aren't many things worse than being a Muggle and not getting invited to Hogwarts. He is still squarely in the "suspension of disbelief" phase of life, while Ava is inching out of it, but I have to admit I love how seriously he takes things. He's also changed his name to Harry Potter, thank you very much. I think I know what their halloween costumes may be next year! I think Seth could be a great Draco, personally. Okay, now I'm seriously off to bed. Let's hope there is not more vomit tonight!